While waiting for earnings season to show how firms are forecasting the impact of macro trends, it’s a good time to look over some investing ideas for the future. Having a few names selected that can be picked up in market weakness is always a good way of building quality positions. It also helps in viewing current positions to see if they stack up to alternatives. Regular readers will know that I think the insurance sector is best left alone given pricing and competitive pressures. 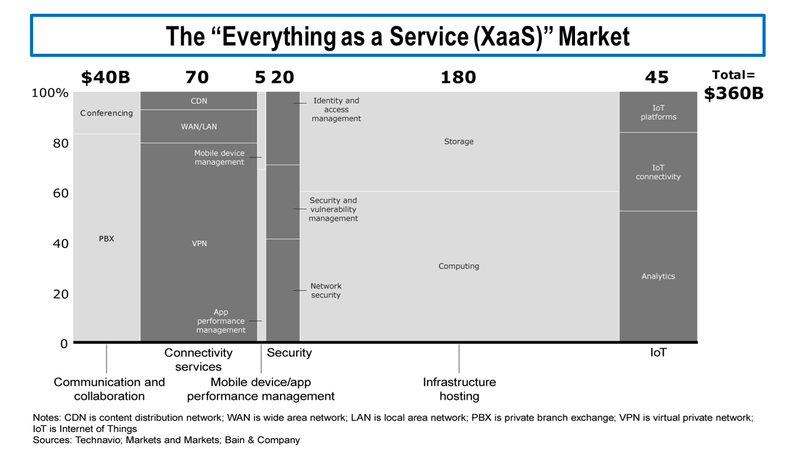 Despite the odd look from afar, I have never been able to get comfortable with hot sectors such as the Chinese internet firms (as per this July post). 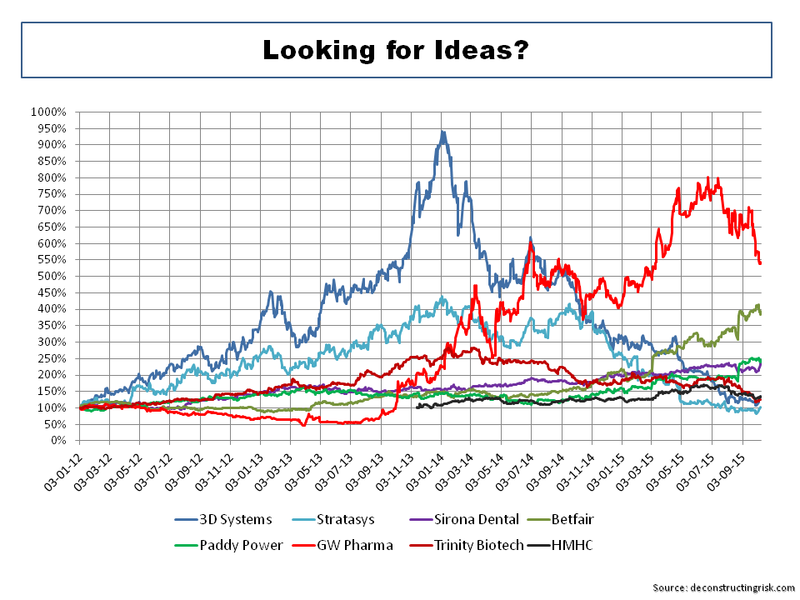 The hype around new technologies such as 3D printing has taken a battering with firms like 3D Systems and Stratasys bursting the bubble. A previous post in 2014 highlighted that a focussed play on 3D printing such as Sirona Dental makes better sense to me. The Biotech sector is not one I am generally comfortable in as it seems to me to be akin to leveraged one way bets (loss making firms with massive potential trading a large multiples of revenue). Firms such as GW Pharma which are looking at commercializing cannabinoid medicines for multiple sclerosis, cancer and epilepsy have had the shine taken off their gigantic runs in the recent volatility. My views on Trinity Biotech (which is not really a biotech firm) were expressed in a recent post in May and haven’t really changed despite a subsequent 25% drop. I need to see more results from TRIB to get comfortable that the core business justifies the current valuation with the upside being in the FDA approval of the Troponin point-of-care cardiac tests. Other ideas such as online education firm Houghton Mifflin Harcourt (in this post) have failed to sparkle. 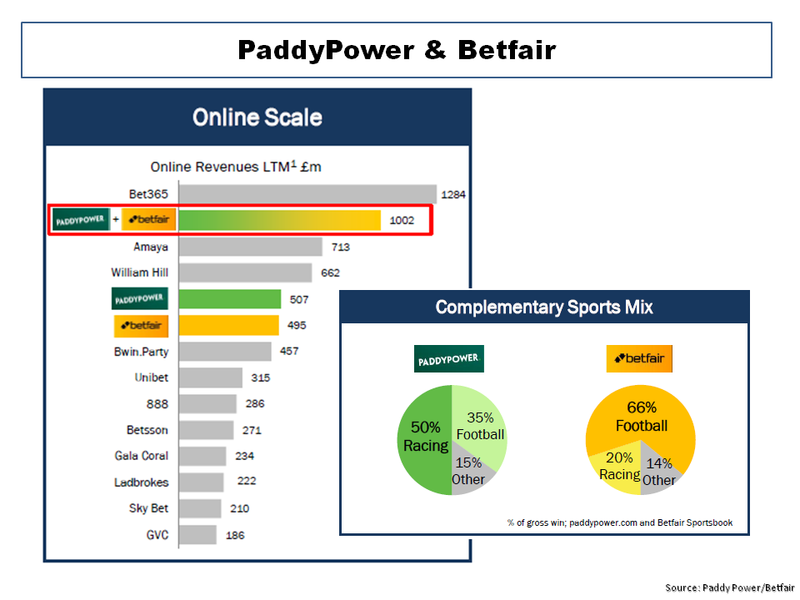 This leads me to the online gambling sector that I have posted on many times (here and here for example) and specifically to the Paddy Power/Betfair merge. My interest in this sector has not been one from an investment point of view (despite highlighting that PP and Betfair would make a good combination in May!) but I can’t get the recent performance of these two firms out of my head. The graph below shows the profit before tax margins of each (with my estimate for 2015). 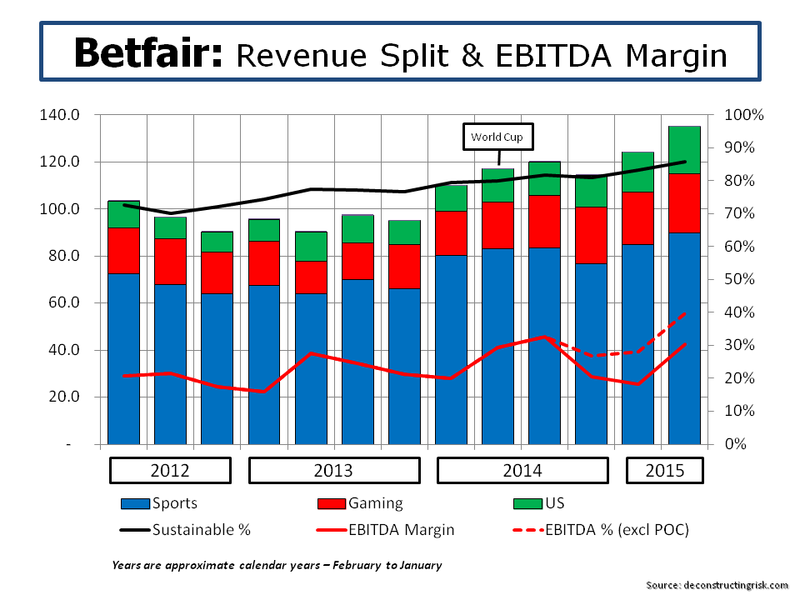 One of the things that stand out is how Betfair’s margin has improved, despite the recent headwinds such as the UK point of consumption (POC) tax. 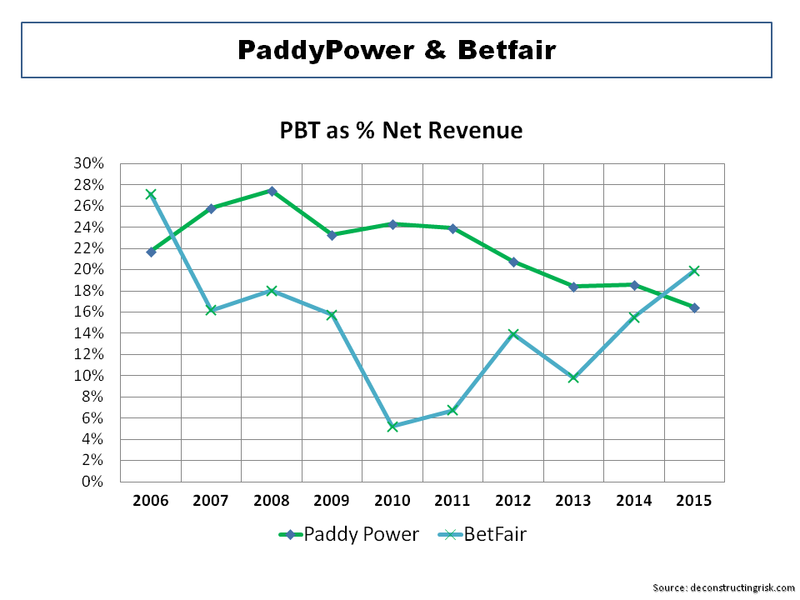 Indeed the market view that Betfair CEO Breon Corcoran is the new messiah can best be illustrated in the graph below on the firm’s performance since he took charge (revenue in sterling). 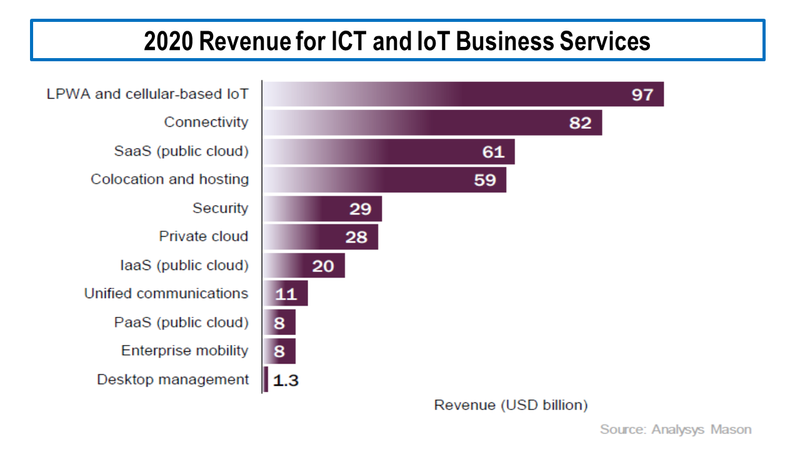 It shows solid revenue growth (particularly from sustainable markets) and the incredible recent growth in EBITDA margin despite the drag of 9% of EBITDA margin from the POC tax. 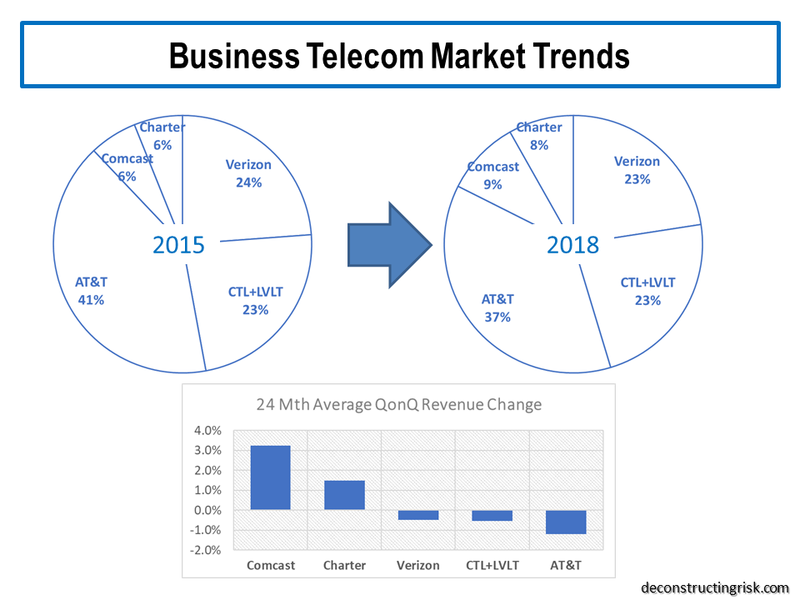 At the most recent results, Corcoran did highlight some headwinds that would bring the margins down (e.g. 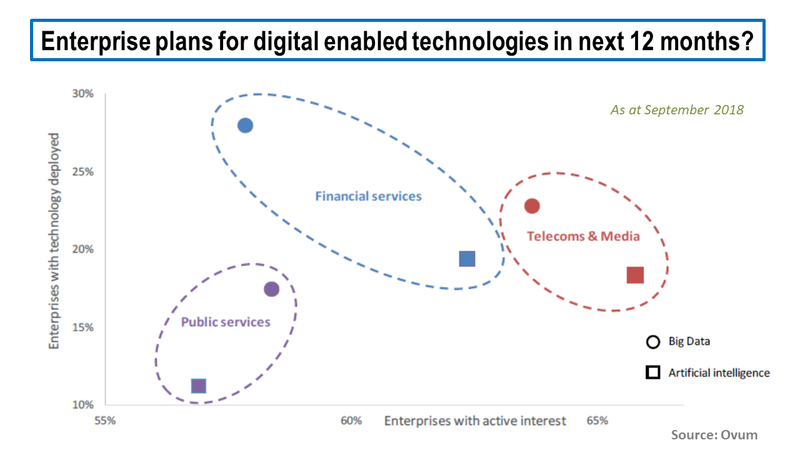 phasing of marketing spend and increased product investment) but emphasised the “high level of operational gearing” in the business and the “top-line momentum”. The merger of these two high class firms under a proven management team does make one giddy with the possibilities. The brokers Davy have a price target of €129 on the Paddy Power shares (currently trading just below €100). More information should emerge as documents for the shareholder votes are published (closing date expected in Q1 2016). 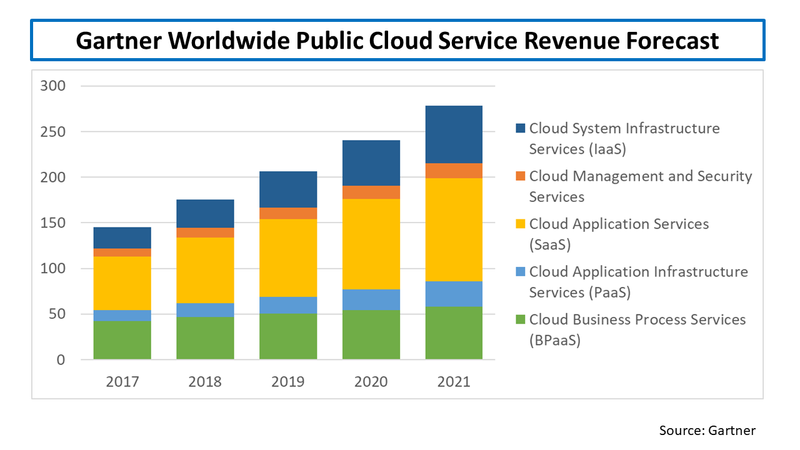 An investor presentation does offer some insight (for example, as per the graphic below). 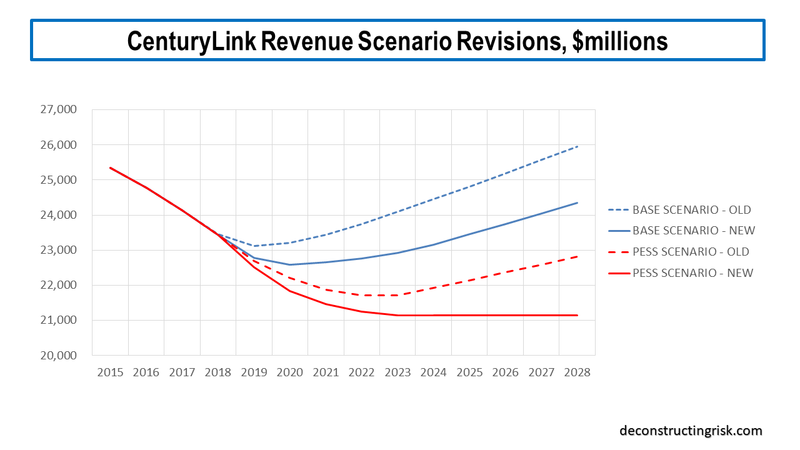 I have calculated some initial estimates of what the combined entity will look like. Using an assumed constant sterling to euro FX rate of 1.30 and trying to adjust for Betfair’s funny reporting calendar, I estimate calendar year revenue growth 2016 to 2015 at 17% assuming a sterling reporting currency, as per the split below. 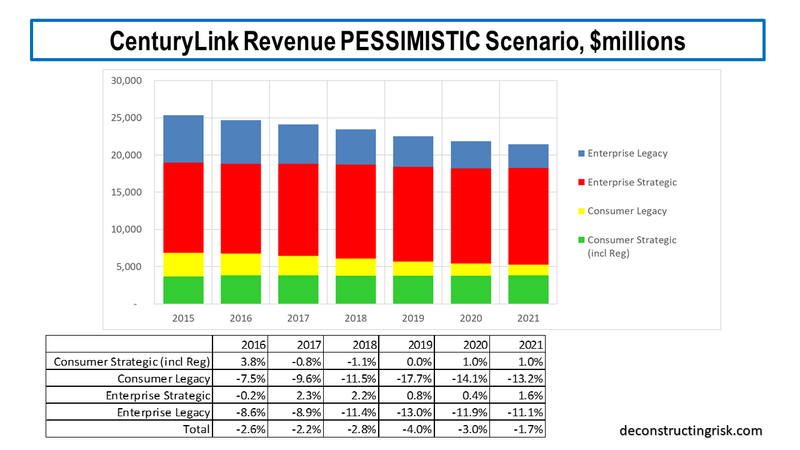 I also calculated a profit before tax margin for the combined entity of 18% which increases to 21% post cost savings. 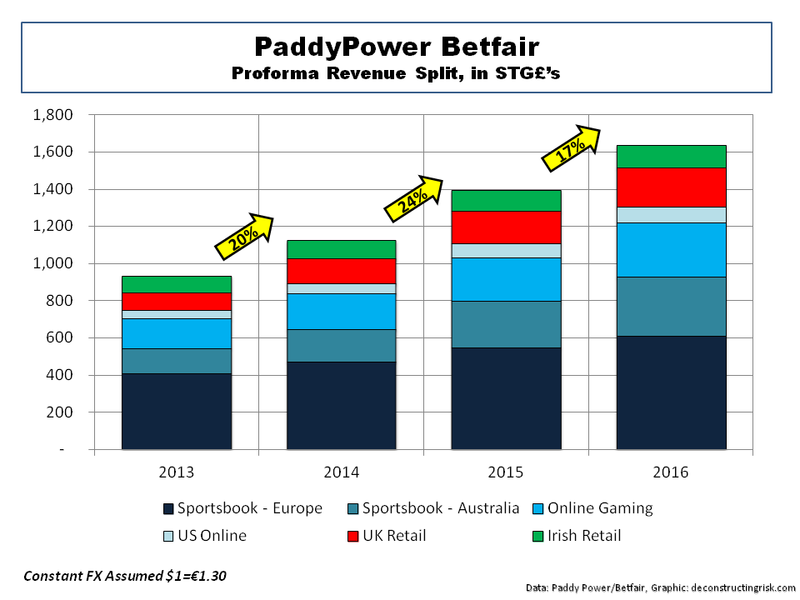 Given approx 91 million shares in the new entity, my estimated operating EPS for 2016 is therefore approx £3.85 or approx €5.00 which gives a 20 multiple to operating earnings at the Paddy Power share price around €100 today. So is buying into the merger of two quality firms with top management in a sector that is undergoing rapid change at a multiple of 20 sensible in today’s market? That depends whether you think it’s time for a gamble or whether patience will provide a more opportune time. On Friday, Fidelity made a 190 pence offer, which is a 21% premium to the previous day’s close, for the approximately third of COLT that it doesn’t own. 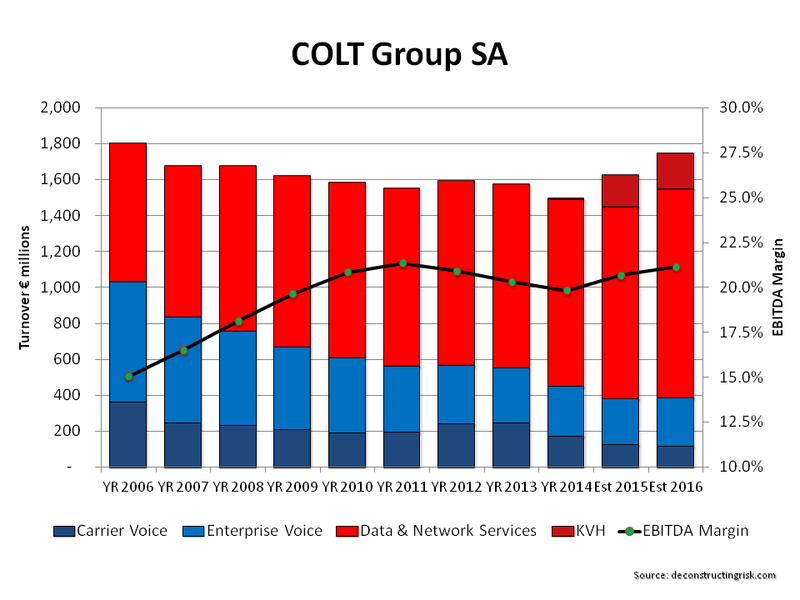 After years of underperformance and a series of restruturings, COLT has been long looking for a positive future. It bought the smaller Fidelity owned Asian carrier KVH last year (see previous posts here and here). 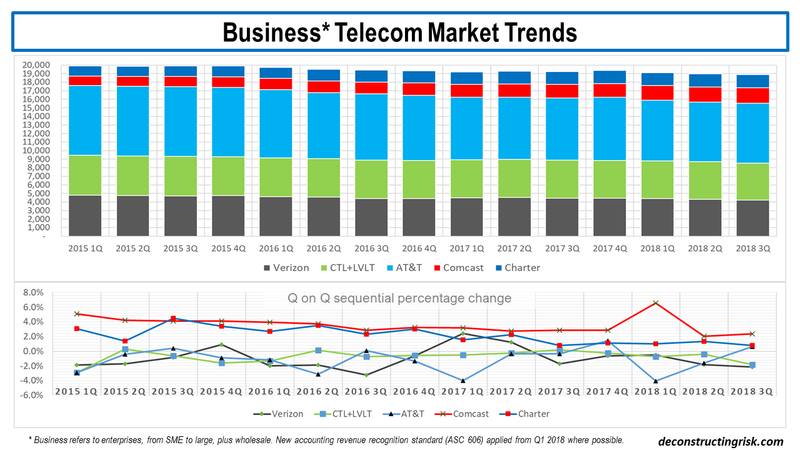 COLT’s core European business has been slowly moving to higher growth and margin data and network business, as the graph below shows. Fidelity’s offer values the debt-free business at £1.7 billion (or €2.4 billion or $2.7 billion at current FX rates) which I estimate to be 7 times 2015 EBITDA or 6.44 times 2016 EBITDA estimates (assuming 2015 EBITDA of €335 million and a 2016 10% EBITDA YoY growth). The independent directors have called the offer too low but haven’t made a recommendation due to the lack of options for minority shareholders. From Fidelity’s viewpoint, this looks like a clever move to force any likely bidders out into the open or, failing any bidders emerging, to take the firm fully private at an attractive price. 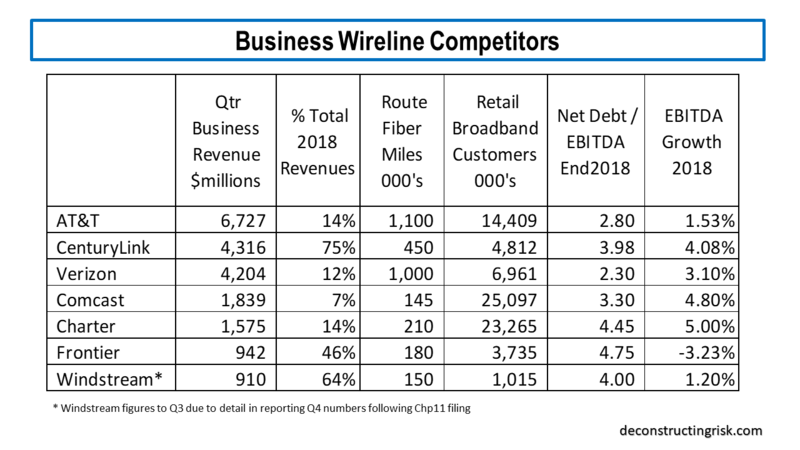 Robert Powell over at telecomramblings speculates that other European carriers such as Interroute or the US based Level 3 may be possible bidders. It will be fascinating to see how this one plays out. 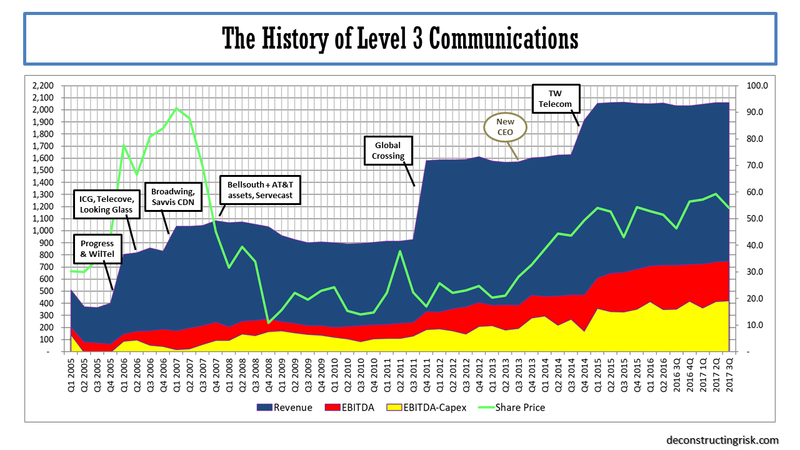 It’s now been 6 weeks since Level3 and TW Telecom announced their intention to merge, as per a previous post. 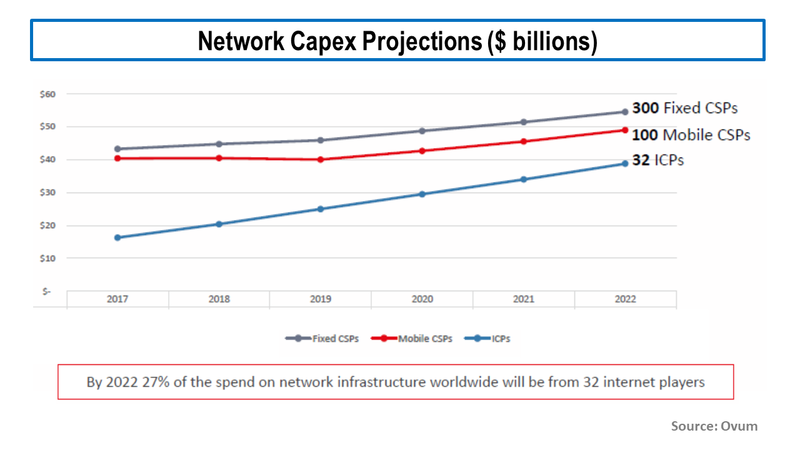 Without any other bidder emerging and with the announcement of the merged entity’s intended management team, basically the existing L3 team with TW senior managers running the US business and the IT side, the deal looks like going ahead absent any unforeseen hic-cup. Level 3 released a S-4 filing which outlined the negotiations and the figures used by each sides’ advisors during the negotiations. I always find the detail behind such deals interesting reading and this is no different, albeit in this case relatively straight forward. 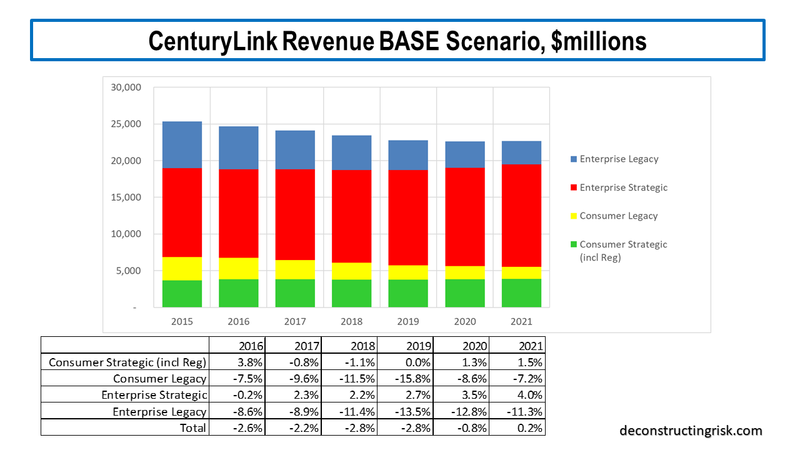 The valuations provided by each of the advisors yielded some interesting data. 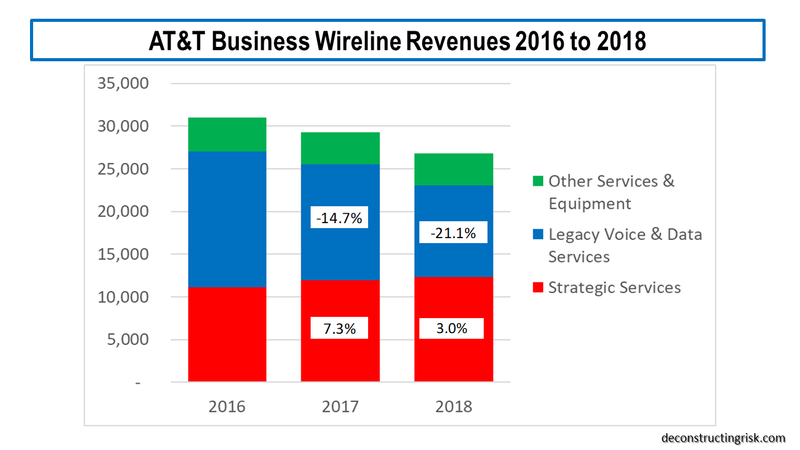 The management of each side, Level3 and TW Telecom, provide their estimates of future results which the other side then adjusted (the sensitivity case) to use as the basis for the deal. 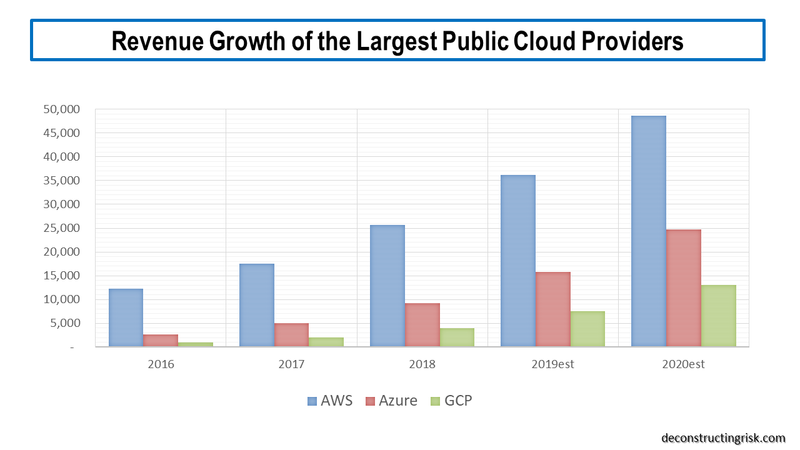 Given that each management team would have tried to maximise the value of their own firm during the negotiations, these estimates are likely optimistic projections. 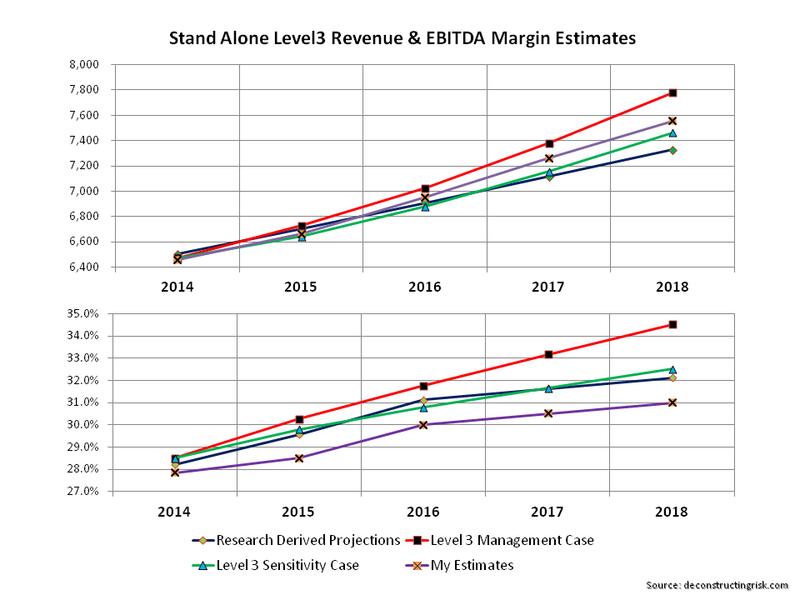 The graph below shows the revenue and EBITDA margin projections of each for a stand alone LVLT compared to the public analysts’ estimates (called Research Derived Projections) and my own estimates. 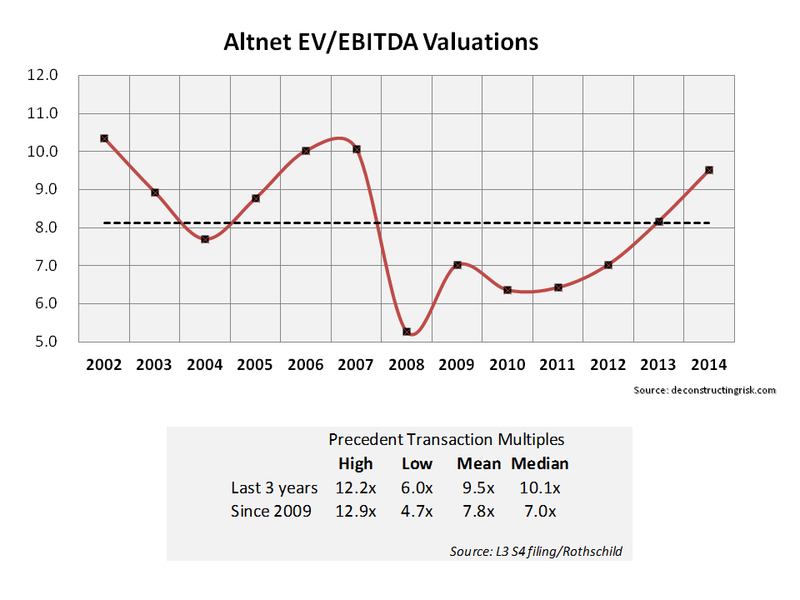 As my revenues estimates were roughly in the middle of the management estimates and the sensitivity case, I have used the average of both for my new estimates of the combined L3/TW entity as my new base case for valuation purposes. 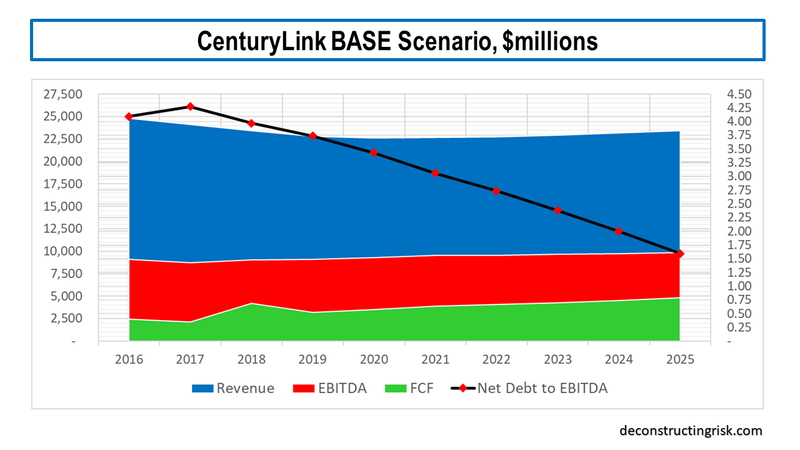 I have also used the EBITDA margin from the sensitivity case as my base with the assumed operating savings of $200 million plus the combined capex of each firm with the full savings assumed of approx $40 million, whereby both cost savings don’t fully kick-in until the 2016 year. 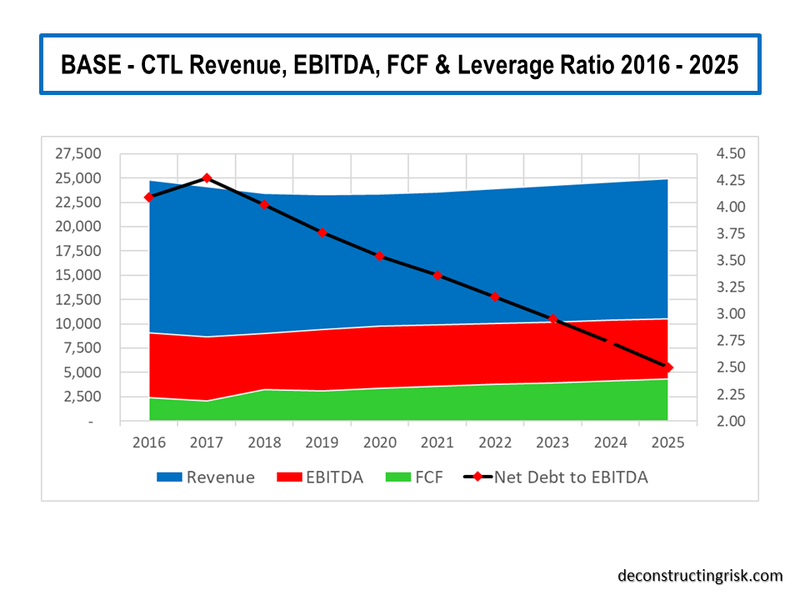 The results for the 2016 year are not far off my initial estimates in the previous post with revenues of $8.9 billion, an EBITDA and capex margin of 34% and 15% respectively. 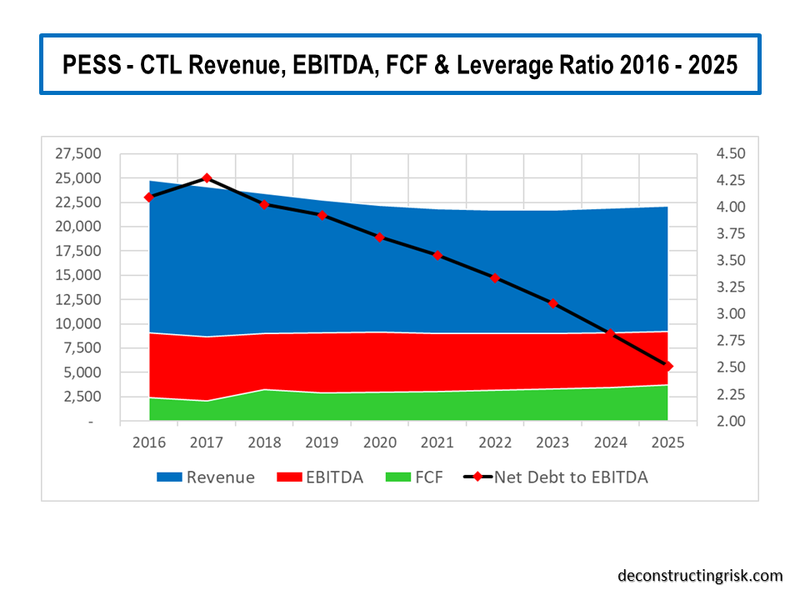 The S-4 outlined the different valuation methods used by the advisors, including DCF and EV/EBITDA multiples. 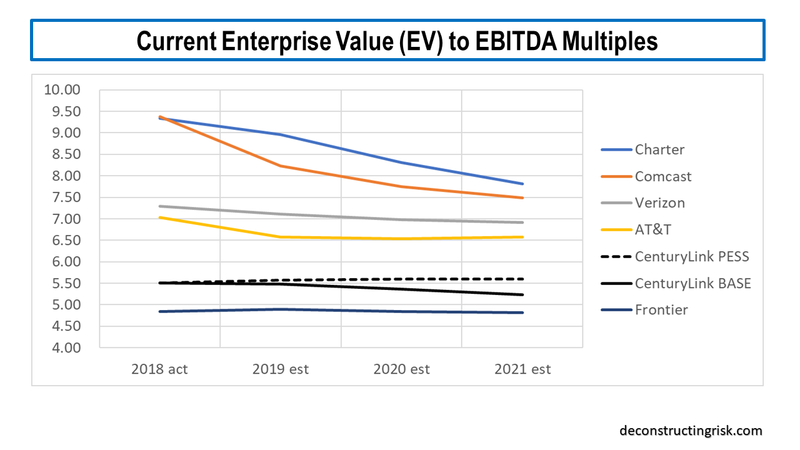 Evercore, one of the advisors, applied a 10x to 13x 2014 EBITDA multiple to determine an implied equity value range and calculated illustrative future stock prices by applying a forward multiple range of 8.5x to 10.7x. 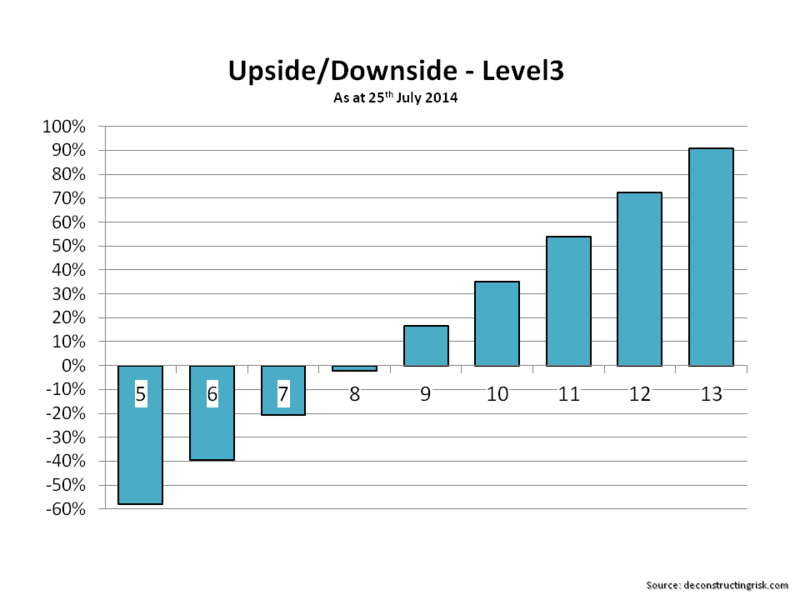 Rothschild, another advisor, selected a range of implied EBITDA multiples of 9.5x to 10.5x. The graph below shows the historical multiples for a group of peer firms (although LVLT and TWTC tend historically be above the average peer) that I have kept track of. The graphic also includes the ranges offered by Rothschild. 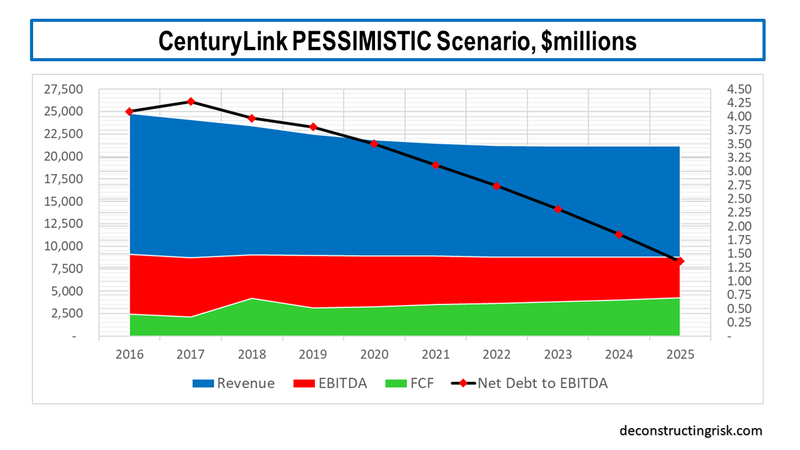 Based upon all of the assumptions above and the balance sheet details offered in the transaction presentation, I calculated the upside & downside to LVLT’s current share price based upon different multiples to the projected 2016 figures. The graph below shows the results (for multiples from 5 to 13). There are a lot of assumptions in the analysis above although I have tended to be conservative. That said I am conscious that LVLT has had a great run-up (equity up 110% over the past 12 months with big gains on the calls) and looks fully valued today based upon execution risks in the TWTC deal, as well as the general frothiness in the US equity market. For those who already own LVLT, buying insurance by way of the January 2015 puts around $35 looks like a sensible course of action here to me. For new comers, I would wait for a better entry point (we may get some wobbles in September although my 2013 September post on the subject last year was way off!! ).